A disturbing dramatic interplay is rearing its ugly head over the ongoing investigation into allegations of kidnapping and armed robbery against Chukwudem Onwamadike a.k.a Evans, and other suspects who were recently, rounded up by the police in Lagos. This is also as sources disclosed that the dreaded kidnap kingpin, Evans, has not been opening up well to interrogators about his accomplices although he was said to have mentioned one name. Though details of the disclosure were still sketchy as at press time, sources said investigators were discreet over the case but were seriously looking into his allegations with a view to establishing its veracity and effecting arrest. 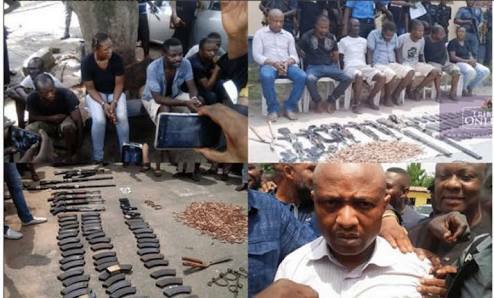 The drama started after three of the suspects who were earlier detained before the suspected kingpin, Evans, was arrested, were granted bail by a Yaba Magistrate court. The trio, Kingsley Egbeonu, Emeka Egbuligha and Tochukwu Nwosu, all staff of Maydon Pharmacy in Ilupeju, whose owner, Chief Dona Dunu, escaped from Evans’ kidnappers den at Igando, were accused of masterminding the kidnap of their boss. They were subsequently arrested after their boss escaped and narrated his sordid experiences while in captivity. Chief Dunu who parted with a huge ransom of N150m, reportedly alleged that while in the den of his abductors, he heard the voice one of the Pharmacist under his employ, discussing with the kidnappers. He further alleged that his abductors, while negotiating for ransom, revealed vital information about his company known only to his workers and that he also overheard them discussing how to remove goods from his warehouse not knowing that he would survive to disclose their identities. Based on these allegations, police investigators swung into action and arrested three of his staff, remanding them in their custody with court order. It was gathered that after the arrest of the celebrated kidnap kingpin, Evans and his subsequent parade at the command headquarters, Ikeja, an identification parade was carried out and both Evans and other members of his gang said they did not know the three staff of the pharmaceutical company. Furthermore, a search at the warehouse of the company showed that nothing was tampered with contrary to earlier claims by the victim that he overheard one of the suspects discussing with his abductors how to part with his goods in the warehouse. Saturday Vanguard learned that after this, their lawyers went to a Yaba Magistrate court to vacate police detention order placed on their heads. Meanwhile, while the accused workers were jubilating over their freedom, their estranged boss was gnashing his teeth, lamenting that police not only failed to provide him with security after he escaped from kidnapper’s den but also did not do a good job following which those he suspected as key accomplices in the kidnap saga have been freed. This, according to sources close to him, has endangered his life the more and his family is accusing the police of negligence. “Our brother not only narrated how he heard the voice of one of his workers while in captivity but also gave vivid details of how his abductors were reeling out details of his company activities before collecting a huge ransom. All we are saying is that police abysmally failed to live up to billing in the court and even while investigating the suspected members of his staff. We strongly believe that one of the members of Evan’s gang who was arrested with his wife is related to one of the suspected workers, and the fact that they denied knowing him does not mean that he should be freed. If not, how did they get information about the 40 cars he gave to his dedicated staff sometime ago. How did they know about his warehouse? These are related issues that should make police investigate them properly,” the family source stated. On their part, police sources said Chief Dunu has not been showing up since he escaped from the den of the kidnappers. “As soon as he got his freedom, he disappeared without giving police his contact. We managed to get him to make statements later and after that, we did not see him again. Just imagine, almost all the victims have been coming forward, not only to commend police for the arrest of their tormentor, but to also make useful statements that could assist us carry out successful investigations into the criminal activities of the gang and their leader but Chief Dunu remains incommunicado. What do you expect us to do? Go and arrest and force him to aid our investigations or what? Meantime, Saturday Vanguard learned that lawyers to the released staff of his company are threatening to go to court to redeem the image of their clients which they said had been so much bruised and battered by their arrest over the kidnap case. One of the lawyers was overheard saying that the case was adjoined for next month to enable police conclude their investigations and if eventually they are exonerated, which we are sure will happen, they will seek redress in court against the Chief for defamation of character and wrongful detention by the police. Similarly, Saturday Vanguard gathered from reliable police sources that Evans might be flown to Force Headquarters, Abuja to meet with the police hierarchy for thorough interrogation over his criminal activities. Already, efforts were been made to prepare him for the meeting which sources said could include meeting with the Inspector-General of Police, Ibrahim Idris. Detectives attached to the Intelligence Response Team, IRT, of the IGP’s special squad are still taking the kidnap kingpin to places in Lagos and environs with a view to identifying all the houses he used as cells during his escapades.